Most of us spend a lot of time on the computer, tablet, smartphone. All this prolonged period of near vision can take a toll to our eyes. It can cause of fatigue, eyestrain, blurred vision to our eyes. We can provide you with a pair of glasses that can reduce this problem, help block glare from screens, as well as help filter some harmful blue light from the screens. We accept FSA (Free Spending Account) so use it before the end of the year! ​to schedule your appointment today! Welcome to Fashion Eyes Optometry, where the one-on-one attention we give each patient sets us apart from others in the field. Since the year 1992, we have been serving of cities of West Covina and it's neighboring cities, (Walnut, Rowland Heights, City of Industry, and La Puente) , with the highest level of eye care. Your eye health is of great importance to us! We provide routine eye exams, LASIK, and screening for glaucoma and cataracts. We also specialize in hard to fit contact lenses, hard contact lenses, and name brand eye wear including name brand Sunglasses. We can also help you with treatment of eye diseases, allergies and injuries as well. At Fashion Eyes Optometry we are more than happy to support all of our patients - from young children to seasoned adults - and make sure that our patients are treated like family. From the time you walk through our doors until your visit is over, our dedicated staff will help you with all of your eyecare needs including choosing the correct frames and lenses to suit your eye wear needs. We have specially trained staff who are committed to serving you and your entire family. 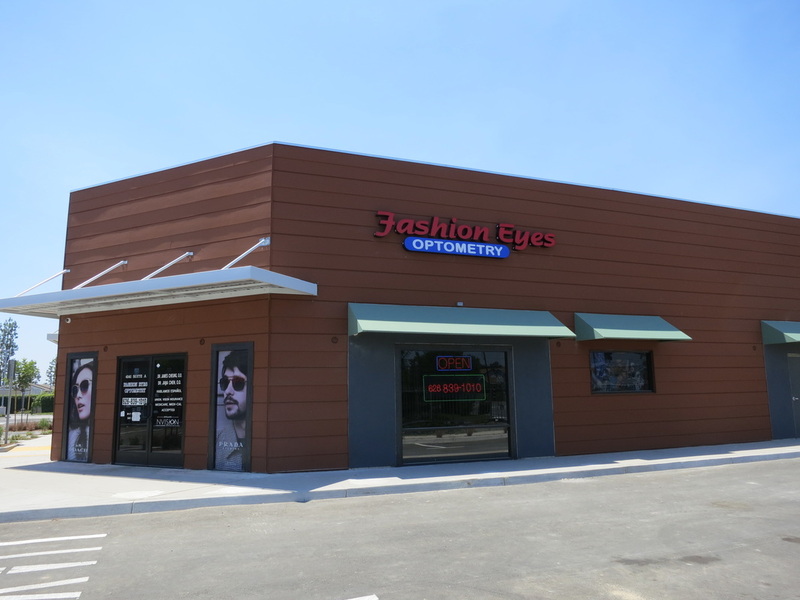 Please visit us Fashion Eyes Optometry located at 4141 South Nogales St Building Unit C101 West Covina, Ca. 91792. Our office telephone is (626)839-1010. We are located at the Northwest corner of Nogales St and Valley Blvd next to McDonalds. We've been in the same location for over 20 years! Dr. James Cheung & Associates are ready to meet you and help you with your eyecare needs! Our main office is NOW OPEN. We can now see everyone for all types of eye examinations, glasses, contacts, eye infections. We are in the same location at the northwest corner of the shopping center. Look for a sign pointing patients to walk to the right (East) side of the building. Thanks for being loyal patients.